Although Abbas and Netanyahu have not sat face to face for the past eighteen months, contacts and cooperation between the Palestinian Authority and the Israeli government have not ceased on several fronts, most notably in commerce and security. Salam Fayyad, Prime Minister of the Palestinian National Authority, spoke at the Herzliya Conference in February alongside Israeli Defense Minister Ehud Barak at a time when his boss, President Mahmoud Abbas, was insisting on a total halt to settlement construction before peace talks could resume. Also, Shin Bet and Israel Defense Forces senior officials have made several visits to Ramallah for meetings with senior PA officials and members of the Palestinian security services. According to the Israeli newspaper Haaretz, Shin Bet security service head Yuval Diskin recently spent a day in the West Bank city of Jenin as a guest of the Palestinian Authority's security service. This is Diskin's second visit of this kind to Palestinian Authority territory in recent months, the aim of which is to coordinate security ties between Israel and the PA. The first visit was to Ramallah. Settlement construction is "business as usual" in the West Bank and East Jerusalem. Although a few projects were pushed back, construction on existing projects continues unabated. Close to half a million Israeli Jews live in more than 100 settlements built since Israel's 1967 occupation of the West Bank and East Jerusalem. More importantly, settlers have accelerated their activities taking over Palestinian homes in East Jerusalem, in Arab neighborhoods in Sheikh Jarrah, Shu'fat, and Silwan. Furthermore, in 2010, more than 240 Palestinian homes have been destroyed in Area C of the West Bank, compared to 182 in all of 2009. Israel's concern over security in the West Bank is exaggerated. Today the Palestinian Authority is policing the West Bank on behalf of the IDF. Very few Israeli deaths, only two in 2010, have been registered due to attacks in the West Bank. In comparison, far more Palestinians have been killed and injured by settlers and the IDF in 2010. Rocket attacks from the Gaza Strip have also subsided. Israel's main security concern these days is Iran. "The threat that Iran poses is very grave for the state of Israel, for peace in the Middle East and the whole world," Netanyahu said in November 2009, repeating variations on this statement on several occasions. Neither Prime Minister Netanyahu nor President Abbas have the mandate to deliver a peace agreement. Netanyahu would face strident opposition from within his Likud party and fierce opposition from his own foreign Minister Avigdor Lieberman who has the ability and influence to unravel his fragile coalition. Abbas also faces a complex problem of legitimacy. His term as President has expired, and under his watch, Palestinian unity was fractured when Hamas managed to rout his forces in Gaza. Hamas leader Khaled Meshaal said recently that Abbas was too weak to stand up to Israel and negotiate a just deal at the talks in Washington. Prime Minister Netanyahu insisted for many weeks that he was ready to come to the negotiating table in Washington, but without "preconditions." In fact both he and President Mahmoud Abbas have already announced preconditions, raising expectations and laying the groundwork for failure. Among the preconditions laid out by Netanyahu for peace with the Palestinians is recognition of Israel as a Jewish state. 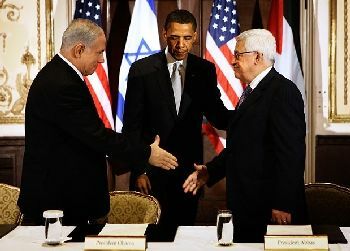 Palestinians consider this condition as a non-starter, instead they'd like to delve into sensitive areas such as the construction of Jewish settlements on occupied territory, the status of Jerusalem, the borders of a future Palestinian state and the right of return, issues that will be difficult to overcome. Meanwhile, Mahmoud Abbas has declared that he will withdraw from negotiations if settlement activity resumes. The settlement moratorium is due to expire on Sept. 26. The Israeli prime minister, Benjamin Netanyahu, seems unlikely to extend it.